A landscape is always a mixed range of features. When it comes to adding warmth and comfort factor to these outdoor spaces, a backyard fire pit or fireplace installation is the best option. These features can be added to the yard space or built on a deck or patio. When you have cozy elements on your property, you will be more encouraged to use these space. This also adds to the value of your property. When you are considering getting outdoor living features installed, it’s important that you use the services of a company that will be able to provide you the kind of solutions you need. Many homeowners like the look of natural stone, but this material tends to be heavy and so we often need to build a concrete fireplace and then clad it in brick or stone veneer. This gives the installation the appearance of stone without the intrinsic heaviness of stone. Fire pits designs are an excellent feature when you don’t want to install a fireplace. The latter can be very large and tends to dominate the landscape. On the other hand, backyard fire pits are smaller, provide the warmth you need and they also create a very cozy campfire-like atmosphere in your yard. In this installation too, we follow a similar design process and ensure that you get the kind of custom fire pit design you want. And so, whether you want a stone fireplace or a brick fire pit, Ivy Studio is the company that can handle it all for you. We know what it takes to provide solutions that work for our clients and go out of the way to exceed expectations on all fronts. You only have to tell us what your vision is and our experts will devise solutions that work perfectly for you. Ivy Studio has landscape design experts that provide comprehensive landscaping solutions to the greater Boston and Massachusetts Bay area. 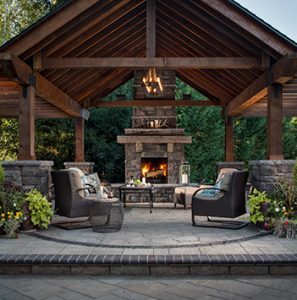 Get started on your landscape design project today to discuss outdoor fireplace and fire pit design options, or take a look at the other landscape design services we offer.